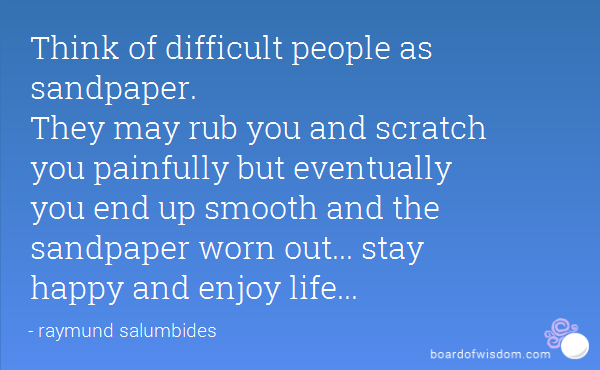 Do you know “difficult” people? Can you be “difficult” at times? Of course, we can all be. Years ago I heard from someone that there are only 2 kinds of people in our world – some are our “friends” and some become our “teachers”. The “friends” are the ones that mean really well and want to see us succeed. The “teachers” on the other hand are the ones who may not give us immediately what we want. They push our buttons or even try to increase our self-doubt. Now while I love and appreciate all the people who supported me along the way, it is definitely the group of “teachers” who benefited me the most. That’s how I learned and grew as a person. The “teachers” in my life have polished me, they have helped me to develop mental strength and the drive to succeed. Every time when I meet people who give me a hard time in my personal or professional life, I recognize the “teacher effect”. I immediately start thinking why I was meant to meet this person and what I am supposed to learn from him or her. If I manage the situation well, I know that I will get to the next level. If not, I will get the same lesson over and over again until I get it right. Live, learn, be happy and enjoy life. That’s how you become unstoppable!